We were invited to try the Better Beet Salad, which was a new item on the menu. It came with either chicken or falafel. I loved the ingredients in the salad, including beets, roasted yellow tomatoes, basil, feta, and almonds. We also got to check out items from the appetizer section on the menu, and tried the Sampler Platter, which includes falafel, stuffed grape leaves, a couscous medley, hummus and pita bread. Habit Burger Grill recently introduced their Sesame Ginger Salad, which was a tangy, flavorful, Asian-inspired salad featuring ingredients such as edamame, wonton strips, and served with either char-grilled chicken or sushi-grade ahi tuna. 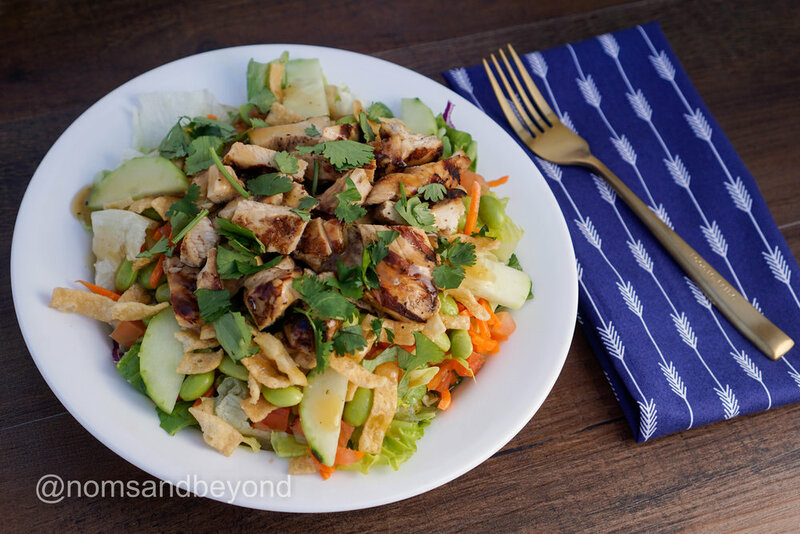 I loved the sesame ginger dressing on the salad. Sharetea also wanted to share a few new seasonal items, the Ice-Blended Chocolate Covered Strawberry and Ice-Blended Taro Mango! They tasted literally like the descriptions, which made these drinks very unique. My favorite was the Ice-Blended Taro Mango. I was invited to check out some fusion tacos and as a huge fan of Mediterranean food, I knew I would be a huge fan of the food! We tried the Falafel, Chicken and Steak tacos. They were so juicy and garlicky, and so flavorful in every bite. I was definitely impressed with their tacos. We checked out this spot in downtown Los Angeles that had a build-your-own couscous concept. I loved all the healthy options they had here to create a tasty and balanced bowl. I got a half couscous/half quinoa bowl, with lamb merguez, beef meatball, and grilled kefta. At the end, the staff completed the bowls by adding broth and harissa. It was a very delicious meal! I had been wanting to check out Pond Ice Cream ever since it opened earlier this year. The flavors available were so delicious and I loved the option to get swirls. I got the Orange Cream and Lychee Swirl with coconut flakes, Pocky sticks and Goldfish crackers. I also chose to get it in a red char cone, which was very festive for Valentine's Day and Lunar New Year. Check out my monthly Milk and Eggs collaborations from February here and here!